Photographing the Northern Lights is one of the most incredible experiences in any photographers’ life. 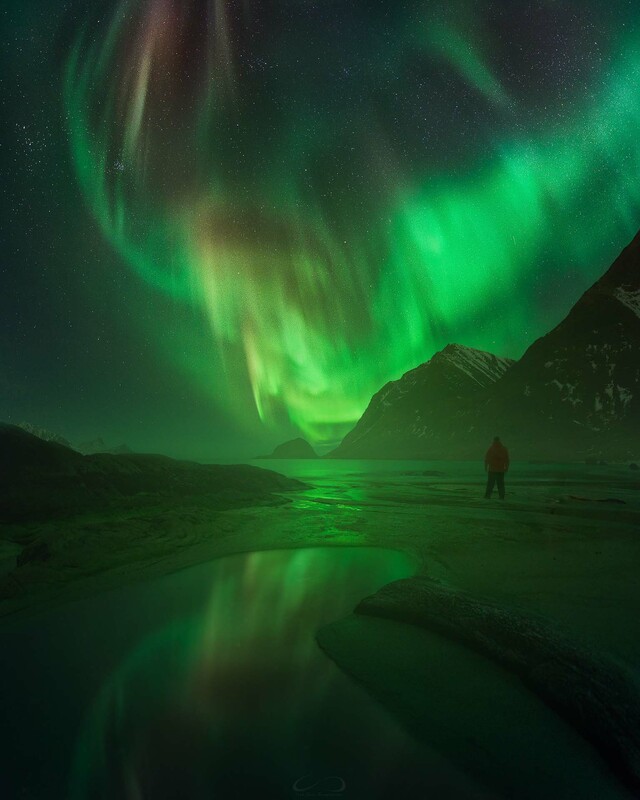 There are no words to describe the feeling of witnessing the celestial fantasy show with your own eyes when the Aurora Borealis dances across the sky. 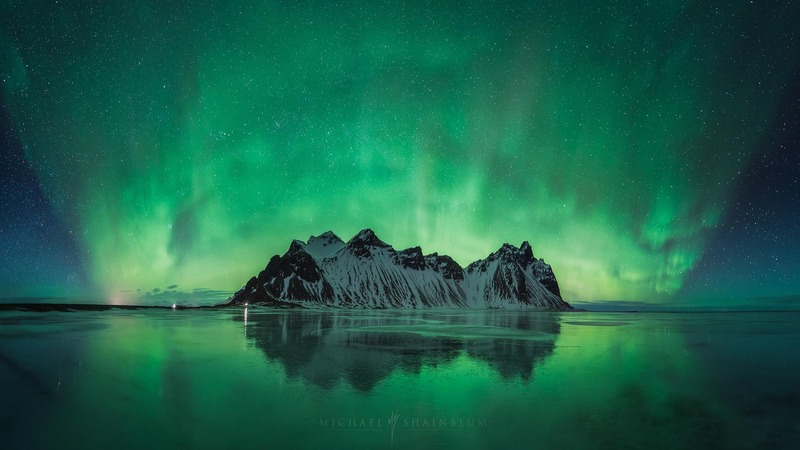 At the same time, it is one of the most difficult phenomenon to photograph – it requires good planning, decent photography gear, and some luck. 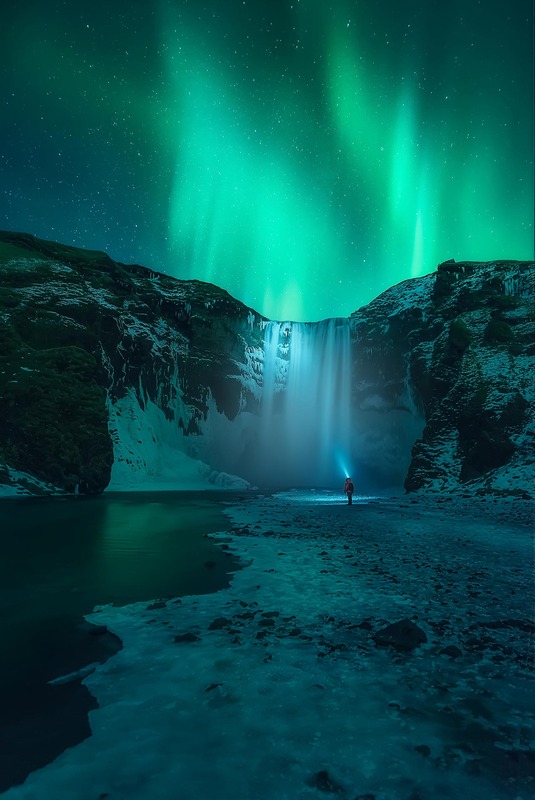 In addition, a good inspiration is also necessary: magical, soul-stirring photographs that show us the beauty of this phenomenon, which drives us to travel and chase the breathtaking “green lady” ourselves. From the Arctic regions of Iceland and Norway to the end of the world in South Pole Antarctica, passing through the Northern regions of Finland, Russia, and Canada, this dance will take you to the extreme latitudes of our planet, captured by some of the best photographers in the world. They dreamed of taking these pictures one day, and we hope that they make you dream today. Last September we experienced a unique night in South Greenland. Probably the night with the most intense Northern Lights I’ve ever seen in my life. The tiny bright light on the right side of the fjord was our yacht. We started the hike in the afternoon as soon as we received a promising Aurora forecast. It took us almost four hours to reach the top of the mountain through rough terrain and strong wind gusts. Once there, we were rewarded with the strongest Aurora borealis display I’ve ever witnessed. The sky was full of deep blue and red colors, all dancing above us. Taking photos was a real challenge because of the wind, but Just 1-3 seconds of exposure was enough to capture the insane Northern Lights shape. After taking some photos, we started the descend in the middle of the night. We were very tired and exhausted, but happy, with huge smiles on our faces. This is one night we will never forget. I took this Northern Light picture in Southern Iceland some years ago during a G4 storm, a rare natural event caused by solar winds which created significant Northern Lights activities. I called the picture “Phoenix from the ashes”, as it reminded me of a giant phoenix rising in flames. It was with no doubt one of the most impressive Aurora Borealis displays I have ever witnessed. 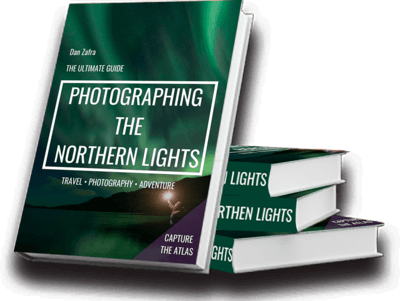 Northern Lights photography comes with many difficulties, with predicting where the Aurora borealis is going to show being one of the trickiest. On this night, our goal was to shoot the Northern Lights from the stunning Stokksnes beach in Iceland, even though the conditions were not very promising given the amount of cloud coverage and low Aurora prediction. 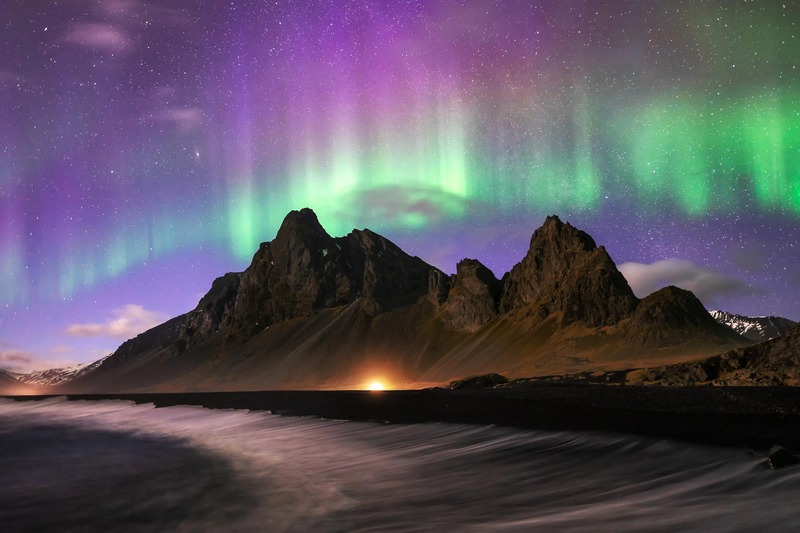 However, to our surprise, the Northern Lights started showing from the north in the middle of the night, filling the entire sky above Mount Vestrahorn. 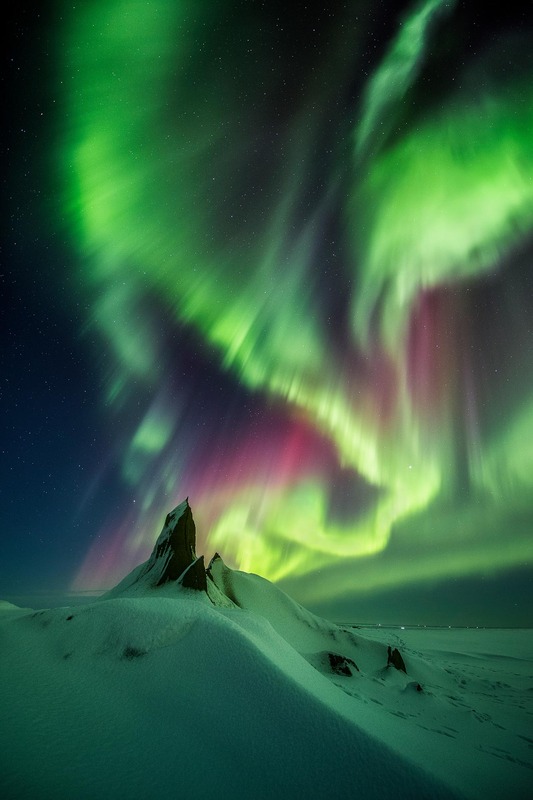 In the end, patience and persistence is what Aurora Borealis photography is all about. 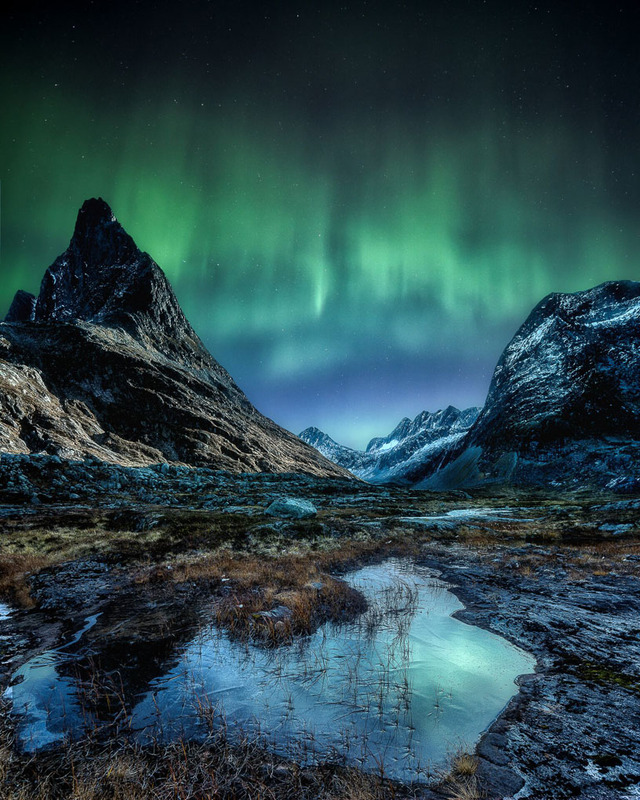 The island of Senja in Northern Norway offers some of the best background scenes for shooting the Northern Lights over jagged peaks and otherworldly fjords. 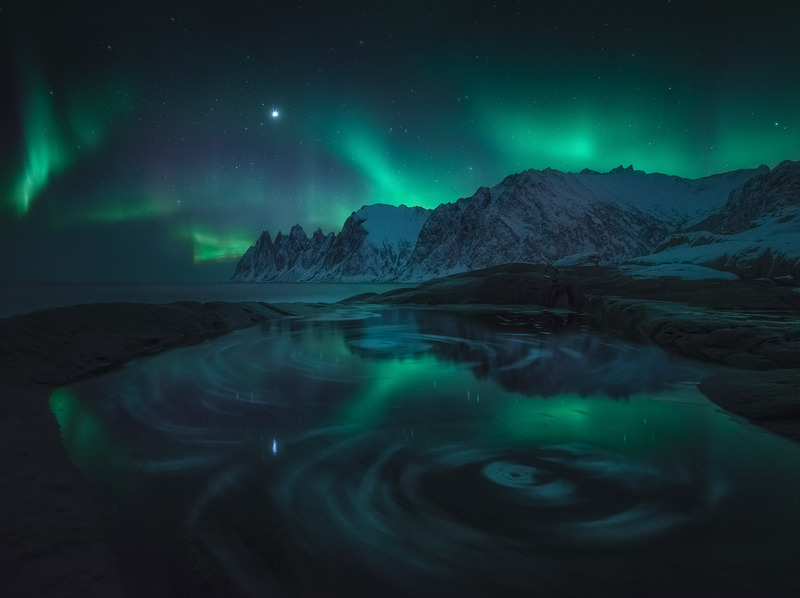 During this night, we enjoyed perfect conditions for shooting mellow Auroras dancing over the sharp peaks, with the swirling tidal pools creating eyes as the perfect witness of the show. I took this Northern Lights image during my Greenland travel about two years ago. We were camping at this location for two days, hoping for some unique light and magic at night. The Northern Lights activity was not very intense that night, but sometimes you don’t need a strong forecast – with some Auroras and a good composition, you can still create a stunning image. For me, sometimes a weak aurora is much more balanced for the whole image than a very intensive one. 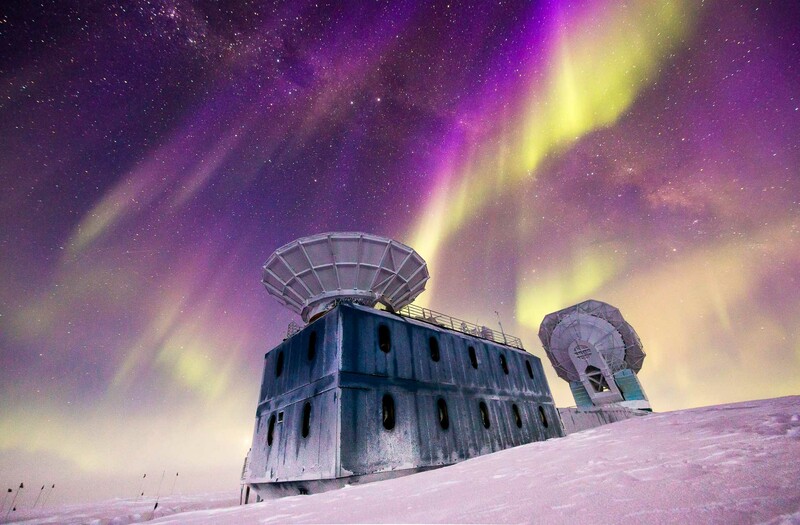 The South Pole Telescope (SPT) looks terrific under the dark skies of an Antarctican winter. When I heard we had a huge solar storm heading our base, I ran out of the Amundsen-Scott South Pole Station to set up my shot. I took my Canon 6D attached to a Nikon 14-24mm lens stuffed in a styrofoam box for warmth and wandered out to the telescope. It was -85ºF (-65ºC) and my styrofoam camera case was packed with a hot water bottle and towels for warmth. That night the auroras blew up the sky and were so bright that It was difficult to see the Milky Way. I decided to just laid back and enjoyed the storm. With no doubt, Antarctica will always be my favorite continent. The Yamal Peninsula is located in the far Russian arctic, and it is one of the most important Reindeer herding areas in the world. There is an ancient indigenous culture intimately linked to these animals, who are still living the same way as their ancestors did hundreds of years ago. On top of that, Yamal is also one of the lesser known best places for photographing the Northern Lights, over the endless tundra. 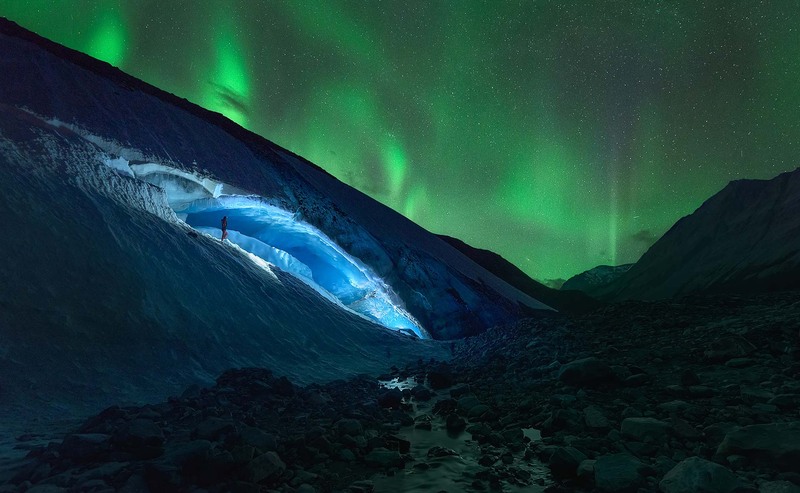 During our trip across the Canadian Rockies, one of the challenges of the trip was taking a nighttime photo of the Athabasca Glacier ice cave. After locating the Ice cave and checking for access and condition, we saw that in two days we would have partly cloudy skies and a KP4 level of Northern Lights activity in the forecast. The lighting of the cave was a significant challenge made possible thanks to the help from and collaboration with other photographers and friends. This, together with a sky tinted in green by the Aurora, made the Athabasca ice cave night an unforgettable experience. 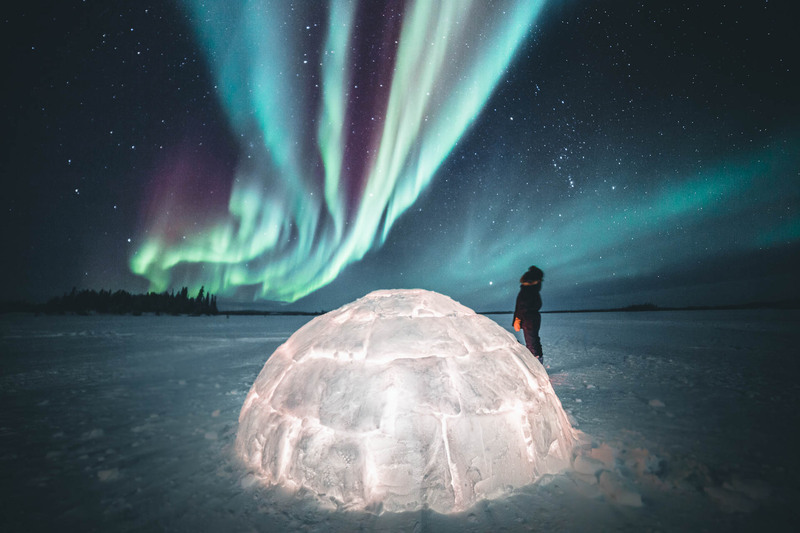 On a –35ºC night in the Northwest Territories, I looked up to the sky outside my tent and saw the Northern Lights go wild – dancing and changing colors in a fast rhythm. I ran down to the frozen lake and lit up a few candles in an igloo we’ve built on the previous day. 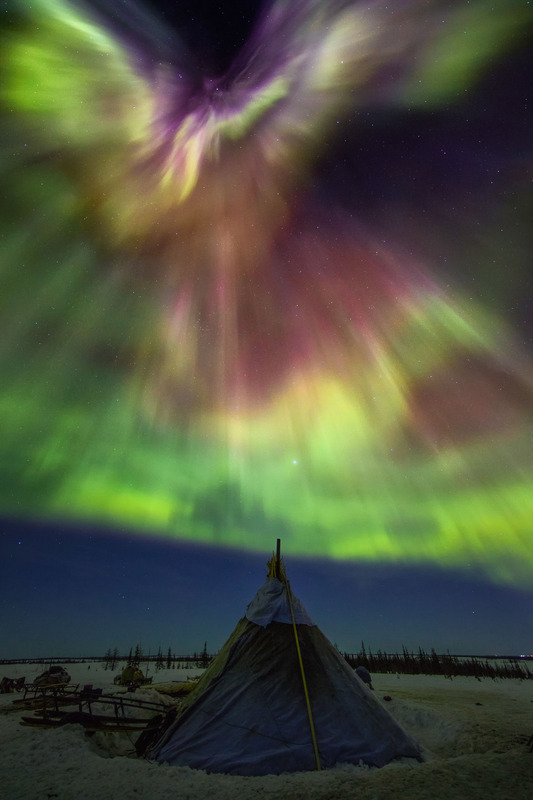 After taking a few shots, I sat down, snuggled up in my polar parka and watched the miraculous show above my head until my toes went completely numb. This image was a lucky thing that happens to me. The Aurora forecast was very low, and the sky was cloudy the whole day while roaming across the east coast of Iceland. Suddenly, our rental Jeep had major problems at Jökulsarlon glacier lagoon, and we had to drive to Vik for a new one. In the end, I was happy that we did, as all of a sudden, the sky became clear at night and the Aurora started going nuts. 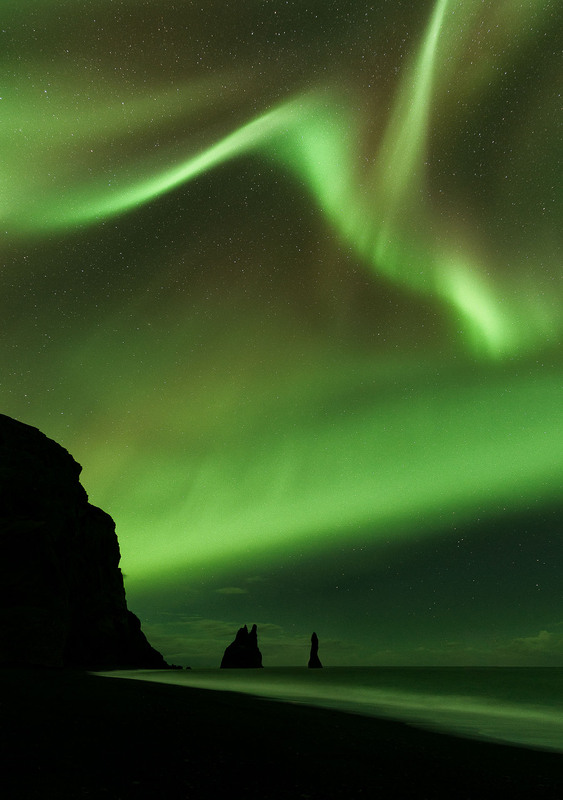 The cherry on top was the Northern Lights corona over Reynisdrangar sea stacks. All alone in the howling wind…priceless moments of life! Eystrahorn is one of my favorite landscape photography spots in Iceland, located in the outstanding rugged eastern coast of the island. Since I visited this area, I’ve wanted to capture the Northern Lights above these characteristic mountains and the black volcanic beach. I spent 14 hours at this location on this day, and the wait paid off during the night. Last September was a very intensive month in terms of Northern Lights activities, with many nights of big Aurora displays. 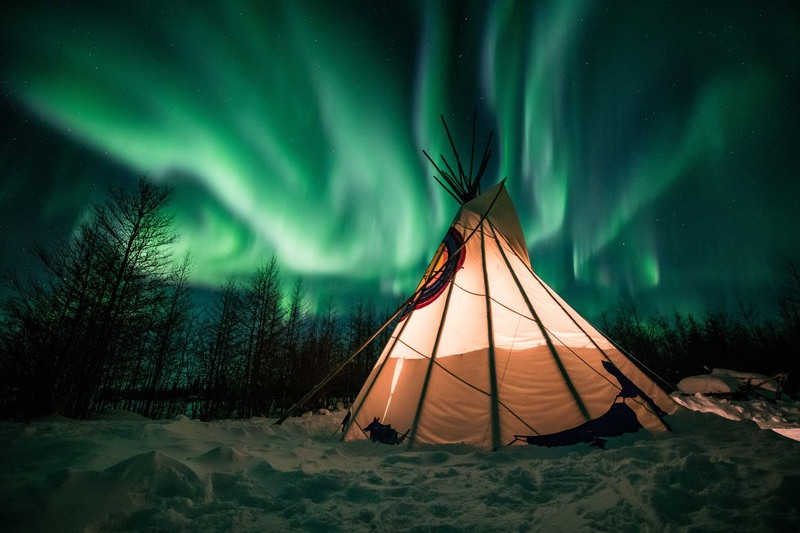 One of the greatest nights of Aurora Borealis I’ve ever experienced happened on one of the nights during my trip across the Northwest Territories in Canada. The reason I love shooting the Northern Lights is that it’s different every time as you never quite know what shapes and strengths you’ll get. 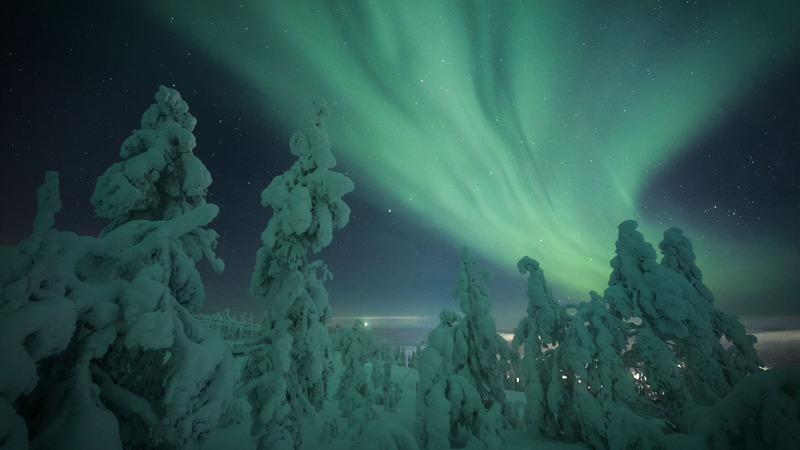 In Northern Finland (aka Lapland), the probability of seeing the Northern Lights are very high as long as the sky is not covered. 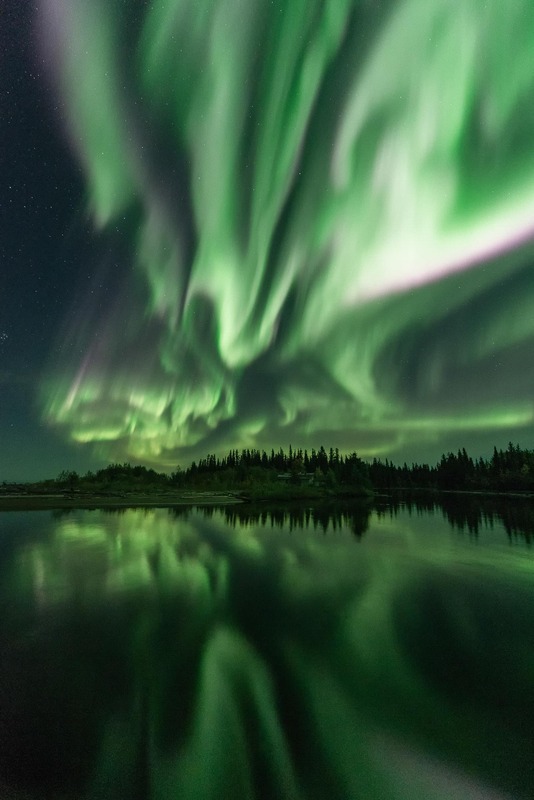 The Aurora season starts from the beginning of September until the end of March. 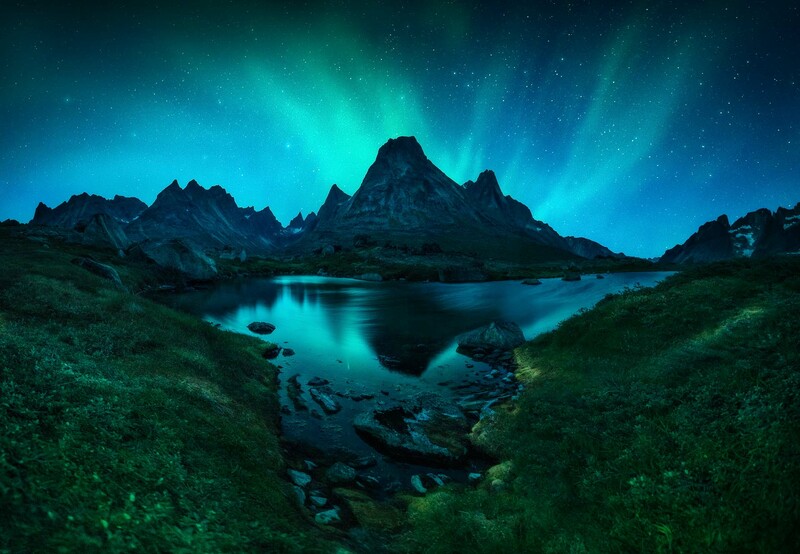 During the summer, nights are not dark enough to see the Northern Lights. In the winter months, it is best to be prepared with very warm clothes as the temperatures can drop down to -30Cº. I personally love getting snow-covered trees in the foreground of my Aurora photos. Another interesting way of shooting the Aurora Borealis in Finland is during Autumn nights by the lakes when the reflection creates beautiful “double auroras”. Dalton Highway is one of the most isolated roads in the USA. Alaska is with no doubt an extraordinarily but hostile environment. Weather is frigid, the roads are coated in ice, and the wildlife can be dangerous. Cell phone service is not available between Fairbanks and Deadhorse and, even if you could summon assistance, the nearest professional help would often be hours away. So, in this setting, even small mistakes can be extremely costly. However, not everything is tricky and dangerous in Alaska. 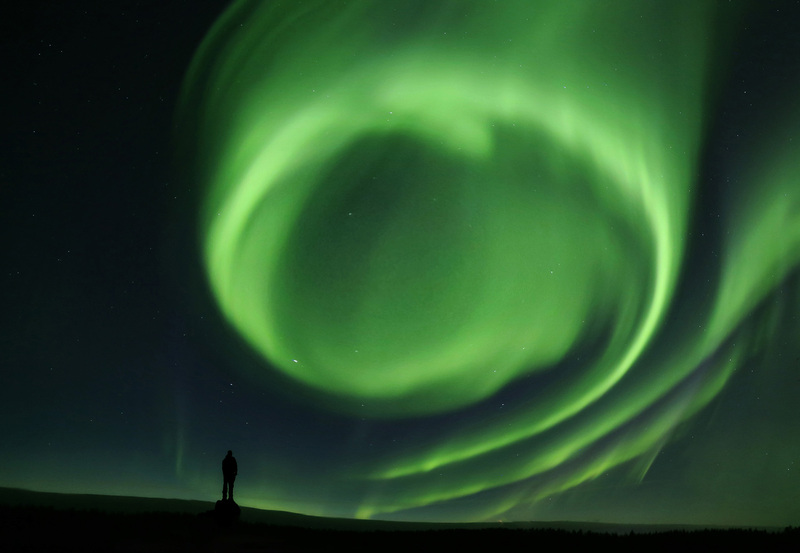 If you are lucky, you get to see beautiful landscapes and epic displays of Northern Lights. Seeing the Northern Lights always create a euphoric feeling in one’s life. The story behind this photo will always remain in my mind. A friend and I walked in the late afternoon to reach the famous airplane wreck. The weather was not very promising, with an upcoming storm in the forecast. Despite the storm, we went ahead, and once we reached the wreck, we took shelter under the elements near the plane. We waited for hours hoping that the weather would get better. 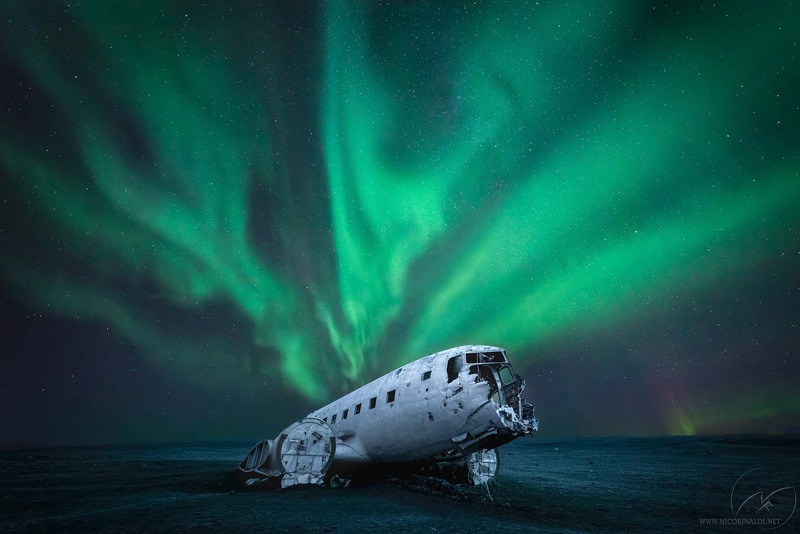 The wait was long, but at 2:00 am the sky started to open, and when I saw the Northern Lights, I felt euphoric, as we got to capture the Aurora Borealis and all the details of the wreck. I took this picture on a cold February night in the impressive Lofoten Islands. There was a very strong wind, as it is usual on this beach, but also a fast-dancing show of green lights. It doesn’t matter how many times you photograph the Northern Lights, the Aurora Borealis is always captured with a different shape which makes every image unique and magical. In the heart of winter when not much life remains in the sub-arctic, you can often look up at the night sky to find energy when the lights shine their brightest. Besides polar bears, Churchill is one of the best areas for seeing and photographing the Northern Lights in Canada. Two years ago, I decided to travel across the famous Trollstigen road in Norway to try to capture the Northern Lights over its impressive landscapes. 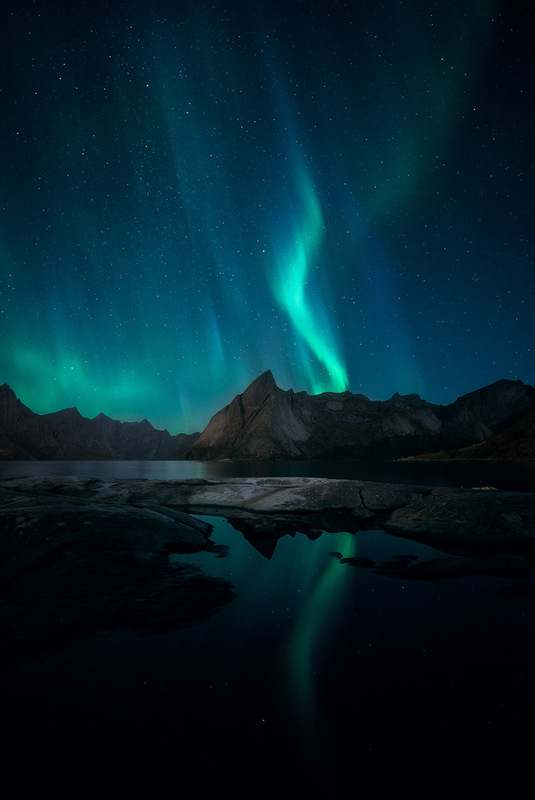 This photo was taken on a night with a bright moon, but also with a strong Northern Lights prediction of KP 6. To me, this is the best scenario as the moonlight provides the possibility of a bright foreground while seeing the Aurora at the same time. The picture was taken using the multi-exposure technique. With two different exposures (the Aurora captured at a shorter exposure), one can create an image where the foreground is sharp while capturing as many Northern Lights details as possible. The north of Iceland is often less visited than the south, but it doesn’t mean it is less spectacular. At the magic lake Mývatn on this night, we enjoyed an unforgettable display of Northern Lights with great and rare colors – we got some turquoise in addition to the “usual” green, red, and purple. 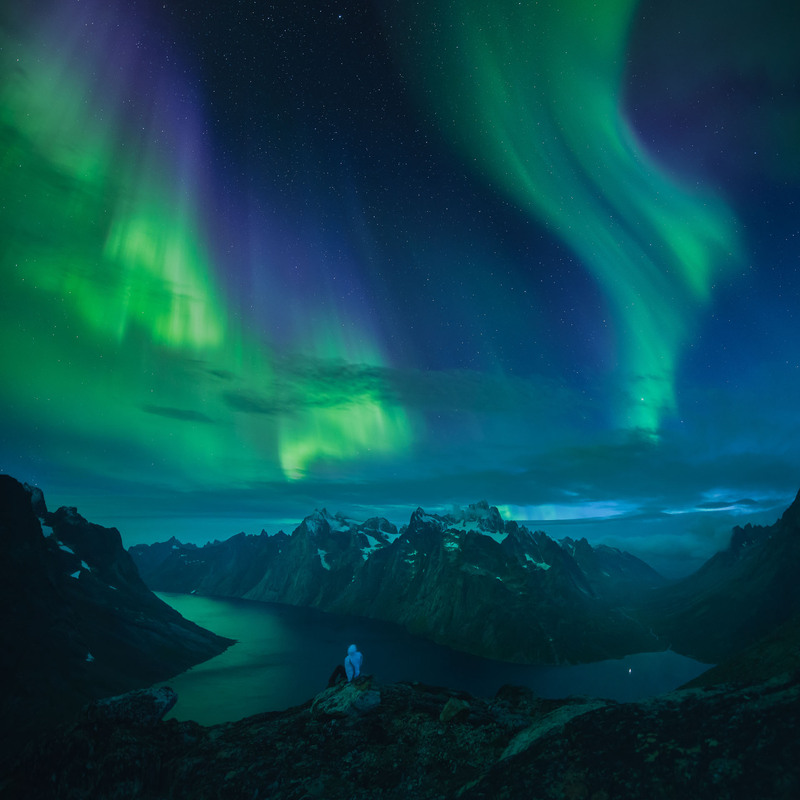 The Northern lights are always impressive, especially when you can see them over beautiful places like the dreamy landscapes of the Lofoten Islands. Reinebringen is a picturesque old fishing village located in one of the most stunning fjords in Norway, and there are no words to describe the experience when the Aurora Borealis danced over the rugged mountains, especially during Autumn nights. The ever-evolving sense of being a part of the remotest of places, with the sound of multiple waterfalls engulfing the senses and sending conscience into the abyss of darkness. A place where just two hours ago seemed like the epitome of serenity was then filled with mystery and shadows. Yet, it still becomes even more captivating than before. 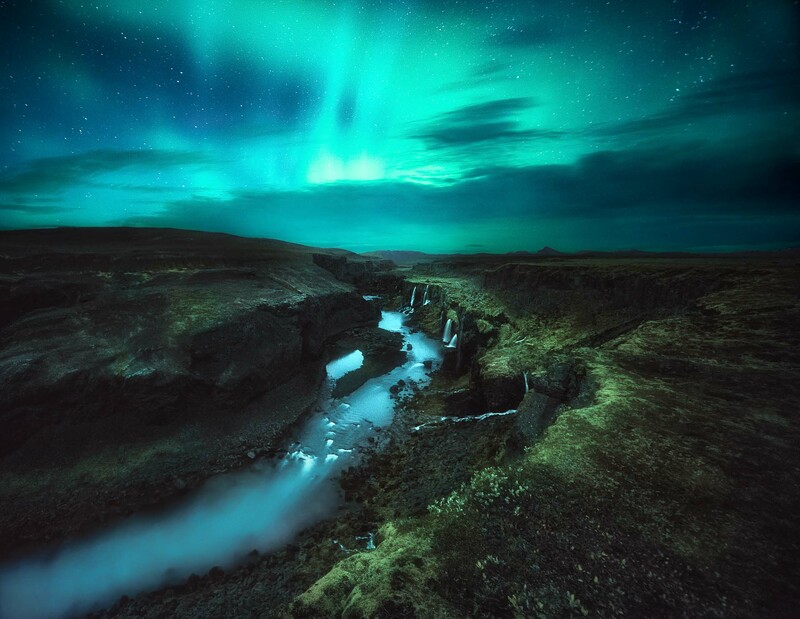 The coldness was intense, but the weather forecast was promising, so a decision was made to stay by the unique Canyon in the Icelandic highlands, waiting for the Northern Lights to dance. This photo was taken in the North Icelandic Fjords the night before a strong Aurora display of KP 7.67. 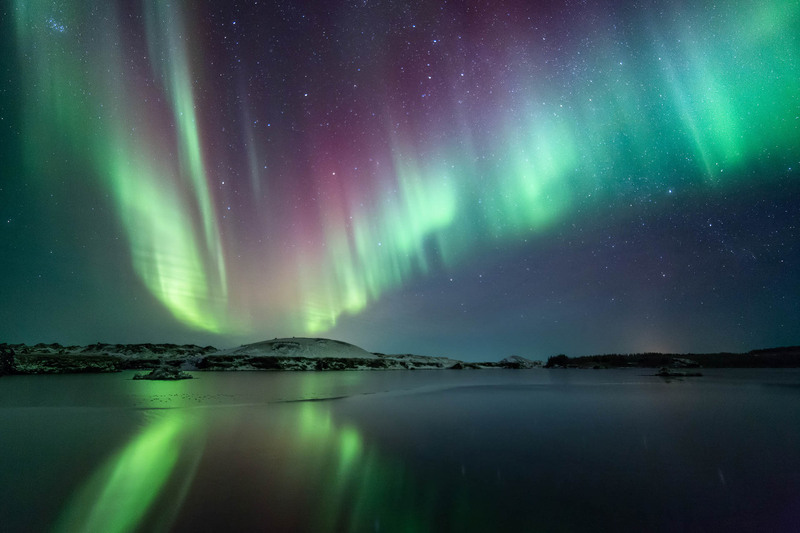 March is one of the best months to see the Northern Lights. 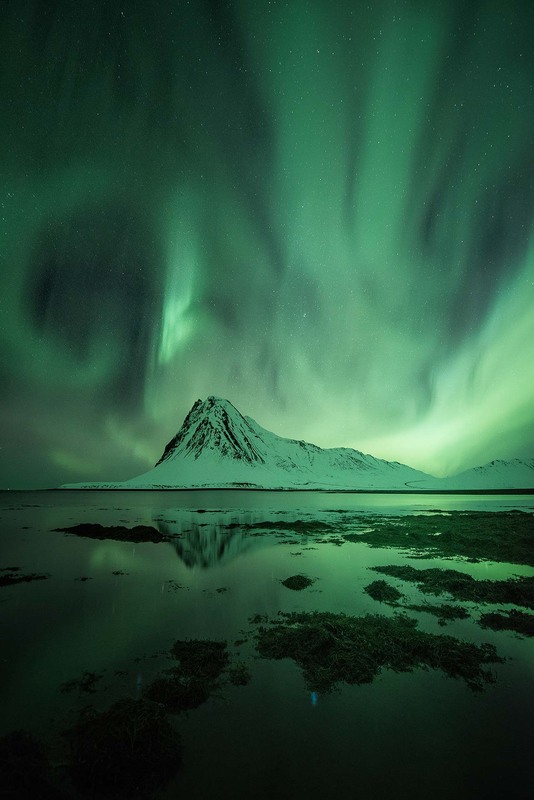 Even though most people travel to Iceland during the winter, the spring and the autumn equinoxes are statistically the periods with more nights of Aurora Borealis shows. You can read about it. You can watch videos of it. But nothing can prepare you for the experience. When the Northern Lights dance, everything else becomes irrelevant. Skagsanden beach, in the middle of the Lofoten Islands, is one of those places that leaves you breathless. During my last photo tour across the Lofoten Islands, after several hours of shooting the Aurora with my group, I could not pass up the opportunity to capture that moment when the aurora twisted on itself, creating a spectacular ring during a show that went on for many incredible hours. 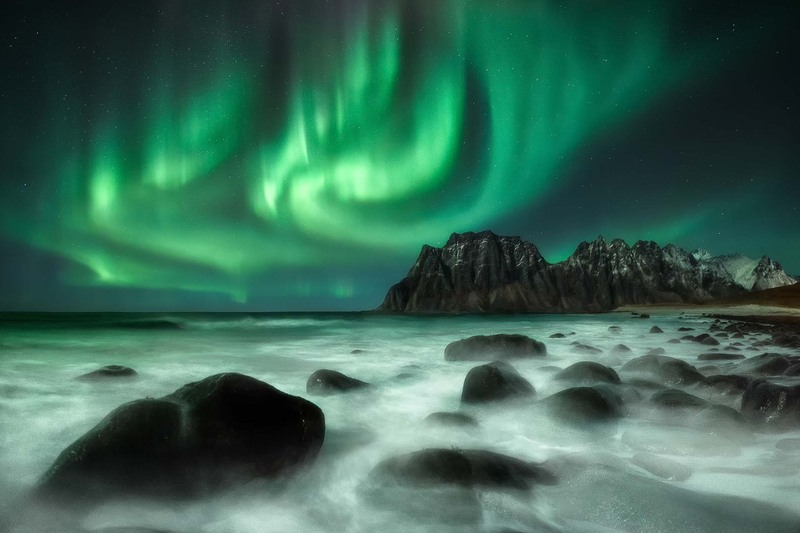 For a landscape photographer, the Northern Lights are one of the most desirable things to capture. Simply trying to see them is enough effort as is, and when finally you get to contemplate this wonderful spectacle of nature, you cannot help but feel incredibly lucky for experiencing something like this. I have traveled to Iceland twice and on both occasions, I briefly saw the elusive “green lady”. It is certainly something I will never forget. Seeing and photographing the Northern Lights is something worth chasing, and not many adventures will make you feel so alive and grateful like experiencing the bright Aurora with on your own eyes. Thanks for reading the article, we hope it will bring some inspiration to you. If you know someone who would also use the encouragement, please send this article to them. Happiness is spread when sharing the beauty of our world. I read this article and found it very interesting, thought it might be something for you. 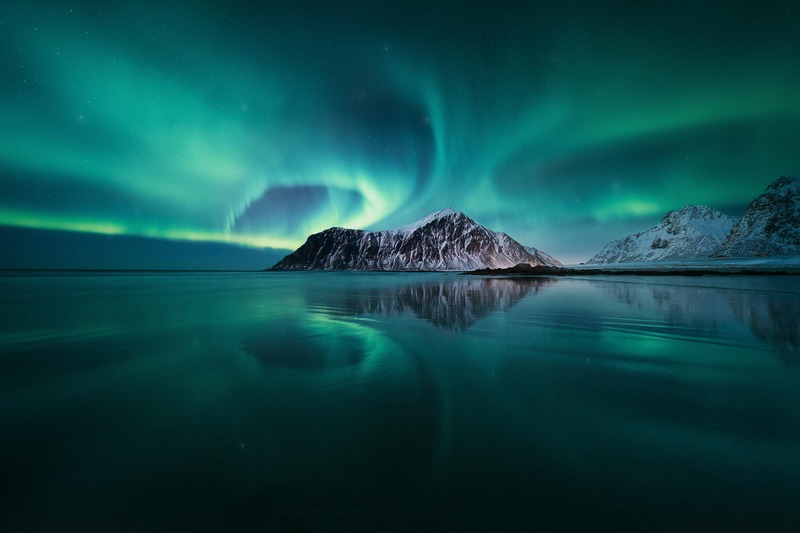 The article is called The 25 Best Northern Lights pictures and is located at https://capturetheatlas.com/best-northern-lights-images/. Before you leave…You can receive more inspirational articles, photography travel guides, and more photo tips and resources. Just subscribe to our community, we are happy to have you in this group of passionate and like-minded photographers! Below you can find the complete gallery with all the images at full size. Enjoy it! Please do not download, copy or share any of the photos here without the author’s prior written permission. Consider the photos here to be protected by copyright. If anyone uses any of the photographs we will take the required legal actions.